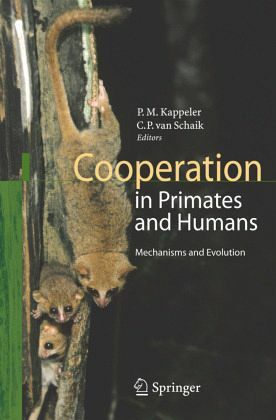 This book examines the many facets of cooperative behavior in primates and humans as some of the world's leading experts review and summarize the state-of-the-art of theoretical and empirical studies of cooperation. This book is the first to bridge the gap between parallel research in primatology and studies of humans. Comparative as this approach is, it highlights both common principles and aspects of human uniqueness with respect to cooperative behavior. Cooperation in primates and humans: closing the gap.- Kinship.- Practicing Hamilton's rule: kin selection in primate groups.- Kinship, competence and cooperation in primates.- Reciprocity.- Reciprocal altruism: 30 years later.- Simple and complex reciprocity in primates.- Reciprocal exchange in chimpanzees and other primates.- Causes, consequences and mechanisms of reconciliation: the role of cooperation.- Mutualism.- Cooperative hunting in chimpanzees: kinship or mutualism?.- Toward a general model for male-male coalitions in primate groups.- Cooperative breeding in mammals.- Non-offspring nursing in mammals: general implications from a case study on house mice.- Biological Markets.- Monkeys, markets and minds: biological markets and primate sociality.- Digging for the roots of trading.- Cooperation in Humans.- Reputation, personal identity and cooperation in a social dilemma.- Human cooperation from an economic perspective.